All I can say about this game guys is WOW! I am presenting you Real Racing 3 made by the giants EA. And I am not going to hide that I am a fan of all NFS games. And this is maybe is the closest thing that you get. EA has made a great game and I am happy to review this masterpiece. So I will start with this that the graphics and the gameplay are great. One of the best thing (for me) in this game is the fact that there aren`t some crazy action mechanics. You have a real, pure racing game. EA has worked hard to increase the “real” aspect of Real Racing 3, now providing fully licensed cars to race on real-world tracks such as Silverstone or the Indianapolis Motor Speedway. Each car definitely feels like it handles differently too, and car repairs must be made too when necessary. The motion controls are great, with braking, steering and traction control modifiable in-game, allowing players to personalize their driving style. 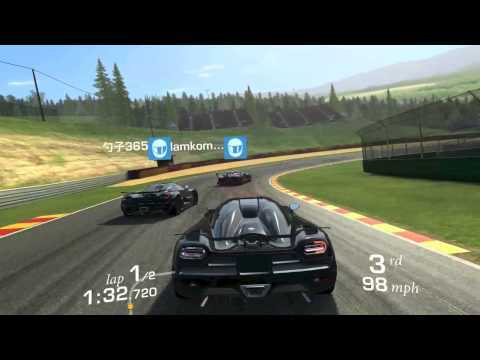 Instead of AI racing rivals, the game implements a multiplayer system called “time shift”, which works by recording the laps made by other players to then overlay on the player’s current race. This means you’re always racing against real people, just not in real-time. Now there is the moment where this game really shines. The way you drive and the handling of the car is the key to win in this game. If you want to be 1st you have to be a good driver with good driving skills which make the game really competitive and challenging. The controls feel very smooth, and the game actually behaves a little differently depending on your car’s stats. I appreciate this attention to detail. You can probably tell the controls don’t include any crazy special powers or a nitro boost. Real Racing 3 is, well… real. You only succeed by driving well, rather than relying on gimmicks to make up the distance. The pure racing experience is executed very well in this title. The dilemma with relying on in-app purchases is that the developer has a vested interest in making the game harder. Some devs take this too far in an effort to extract more money. Real Racing 3 is not particularly easy as far as racing games go, but it does offer some assists to help you along. Steering assist, brake assist, and traction control are all enabled by default. If you don’t want this helping hand, you can turn them all off. Frankly, it’s a good thing these options exist. Some players are going to need them. Overall the many in-game purchases and in-game currencies I think that this is a great game. You can progress without paying but it will be just slower, not impossible. My suggestion is to try it yourself and see.